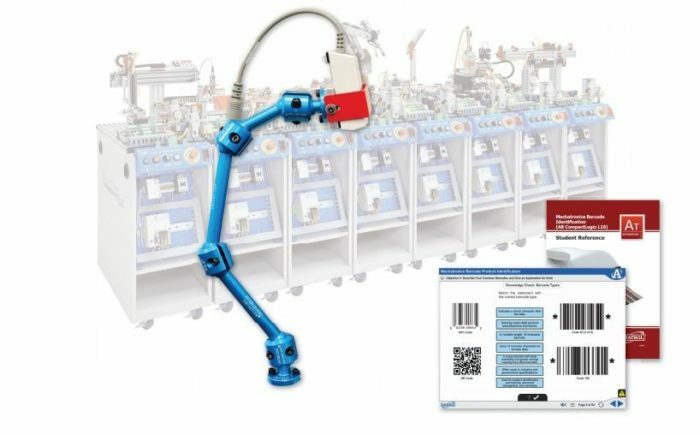 Amatrol’s Mechatronics Barcode Identification Learning System – CompactLogix L16 (87-BR1AB53A) covers the use and operation of a barcode reader within an automated line to identify components, enter serial numbers in a database, and sort items into groups. The 87-BR1AB53A scans barcodes on parts traveling through Amatrol’s 870 mechatronics system and signals a programmable logic controller (PLC) to assemble the parts according to part number read by the barcode reader. Barcode identification systems are used as scanners and for conducting inventory, in real-world applications such as sorting and tracking mail, sorting baggage at airports, and identifying and quantifying inventory in warehouses and shipping centers. The 87-BR1AB53A is used in conjunction with select 870 Mechatronics stations with Allen-Bradley L16ER CompactLogix PLCs. This training system teaches hands-on skills like configuring and interfacing a barcode reader for serial communications and operating a PLC project that uses comparison instructions with a barcode part identification system. The 87-BR1AB53A is used in combination with a PC and the following world-class mechatronics training stations featuring Allen-BradleyL16ER CompactLogix processors: individually with Sorting Buffering Station (87-MS4) or Inventory Storage Station (87-MS7) or in combination with Orientation Processing (87-MS3) and Servo Robotic Assembly Station (87-MS5-P2). This learning system facilitates flexible manufacturing by allowing the system to recognize a part based on the barcode and alter the automated operation accordingly. Learners will practice a variety of hands on barcode/automation skills, such as: reading parts on a rotary table, which tells the PLC on the next mechatronics station whether the part is metal or plastic; using a robot to place a part under the reader in order to tell the PLC the correct spool to use in assembly; and using a reader to sort parts into four different bins based on material. The 87-BR1AB53A features a variety of real-world components so that learners can build competencies that will translate to actual skills that they can use on the job! This learning system includes: a barcode reader; barcode enclosure; reader mounting fixture that can be affixed to any station and features a flexible arm so the reader can be moved; barcode printing software; cabling; and adhesive labels. Amatrol creates curriculum with a conscious intent to seamlessly weave theoretical knowledge with hands-on skills in order to further ingrain each into a learner’s mind. The 87-BR1AB53A’s curriculum is no different. With stunning depth and breadth, this learning system covers barcode function, maximizing barcode scan accuracy, serial communications, PLC string data, programming and interfacing PLCs to serial communication devices, configuring and interfacing a barcode reader, and operating a PLC project. This learning system’s curriculum is presented in a stunning interactive multimedia format that features 3D animations, graphics, text with audio voiceovers, and much more! A sample copy of the Mechatronics Barcode Identification Student Reference Guide is also included with the system for your evaluation. Sourced from the system’s multimedia curriculum, the Student Reference Guide takes the entire series’ technical content contained in the learning objectives and combines them into one perfectly bound book. Student Reference Guides supplement this course by providing a condensed, inexpensive reference tool that learners will find invaluable once they finish their training making it the perfect course takeaway.